Carbon Dioxide Increase Could Lead To Nutritional Deficiencies And Disease : Shots - Health News Nutrients in crops fall as carbon dioxide rises. People who don't get enough of the right nutrients are more likely to get sick. Researchers have now estimated the effects. 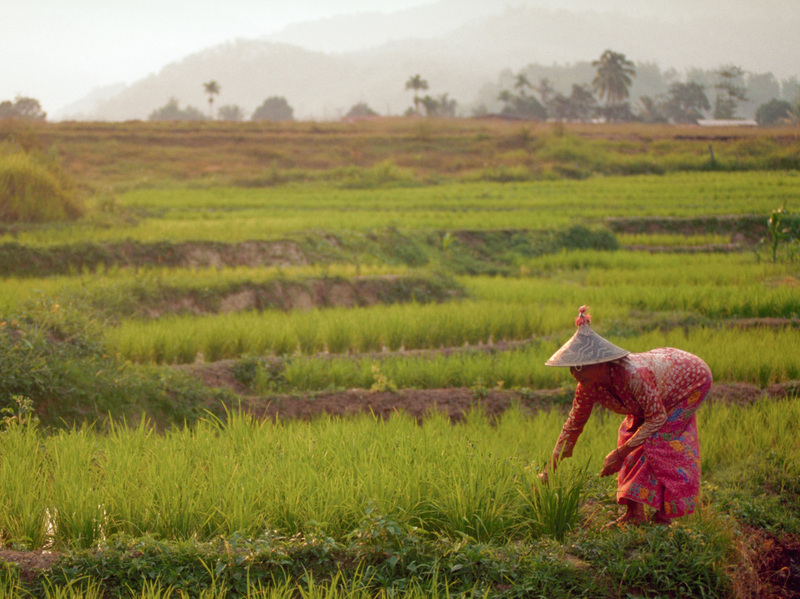 An increase in atmospheric carbon dioxide would lead to a decrease in the nutritional content of many foods, such as rice, seen here growing in Malaysia. That conclusion comes from an analysis published Tuesday in the journal PLOS Medicine, which also examined how the risk could be alleviated. In the end, cutting emissions, and not public health initiatives, may be the best response, according to the paper's authors. Research has already shown that crops like wheat and rice produce lower levels of essential nutrients when exposed to higher levels of carbon dioxide, thanks to experiments that artificially increased CO2 concentrations in agricultural fields. While plants grew bigger, they also had lower concentrations of minerals like iron and zinc. Fewer nutrients in crops means fewer nutrients in food. People who don't get enough of the right nutrients are more likely to get sick. For instance, kids who don't get enough zinc are more likely to contract diseases like malaria, pneumonia and diarrhea. A multidisciplinary research team from Stanford put the puzzle pieces together and saw a potentially disturbing chain of events. "We expect nutrient deficiencies to really increase dramatically from higher carbon dioxide in the atmosphere," says Dr. Sanjay Basu, assistant professor of medicine at Stanford University School of Medicine and one of the study's authors. "In the long run, I think it's likely to cause some chronic problems we haven't prepared for." But how many more people would get sick, and what could be done to keep that from happening? To answer this question, the researchers took the data we already know about carbon dioxide and crop nutrients and extended it to future CO2 concentrations. Atmospheric carbon dioxide concentrations are expected to rise from 400 parts per million to 550 ppm by 2050. Assuming people keep eating the same things, the researchers were able to predict how many more people would become nutrient-deficient as a result of their less nutritious diets. From there, the researchers then inferred changes in disease rates. The results suggest that rising CO2 will cost the world roughly 125 million disability-adjusted life years – which are roughly equivalent to a year of healthy life – because of higher rates of disease between now and 2050. That number can be hard to wrap your head around, but Dr. Samuel Myers, senior research scientist at Harvard T.H. Chan School of Public Health, says that it's in line with previous estimates of "somewhere between 100-200 million people being pushed into risk of deficiency." Myers has authored several papers on the effect of CO2 on crop nutrition but wasn't involved in this study. Most of the people affected would be in areas prone to malnutrition in Southeast Asia and Africa. Developed regions, such as Europe and North America, are unlikely to be heavily affected. Next, the researchers simulated what would happen if countries took steps to mitigate the threat, such as reducing CO2 emissions in line with the Paris Agreement on climate, or passing out zinc pills to affected populations. The researchers found that roughly half of the added disease burden could be avoided if CO2 levels were cut to levels stipulated by the Paris Agreement—480 ppm. But public health initiatives, like iron distribution or malaria mitigation, would only reduce the problem by a 20 percent. "Some of the climate change mitigation policies might be even more effective than public health measures to help avert this problem," states Basu. Mathematical biologist Irakli Loladze, an associate professor at the Bryan College of Health Sciences in Lincoln, Neb., says that this is the study's most important finding. "The novel part is their estimate for the effects of various interventions," Loladze explains. "What's interesting is that interventions such as zinc or iron supplementation actually have little effect." Although it's tempting to believe that nutrient deficiencies are easily solved, Loladze points out it's often difficult. "Many will often say, 'Hey, let's just do supplementation. Everybody will take a pill.' Which of course is very naive thinking," Loladze says. He cites iodine as an example. Iodine deficiency has been effectively treated in many places by adding iodine to food staples like salt. Still, hundreds of millions of people remain iodine deficient because their governments lack the money to implement such large-scale health programs. Other warn against taking the authors' estimates of disease burden too literally. Predictive models are only as good as the numbers they use, and some of the estimates plugged into the model are murkier than others. "We don't have highly accurate information about what everyone in the world is eating," says Harvard's Myers. Myers also highlights the difficulty of linking diet to nutrient deficiency, since the absorption of many nutrients – especially iron – is influenced by a variety of factors such as personal health and whether food contains iron-binding compounds that inhibit absorption. Still, Myers emphasizes that the numbers used in the study are the best we've got. A few things could happen to keep the predictions from coming true. Carbon dioxide emissions could be cut, and global diets could shift. Diets have changed dramatically in places like China, where more people are eating meat, a better source of iron than most plant-based foods. Additionally, Myers notes that some crop varieties appear resistant to the CO2-associated decrease in nutrition, and those varieties could provide the foundation for agricultural production in an increasingly CO2-rich atmosphere. The burden of addressing nutrient deficiency is not likely to fall on the people most responsible for the change. In the end, the study highlights how the habits of affluent countries trickle down to affect the world's poor. "It's the wealthy people in the world who are emitting lots of carbon dioxide," Myers says. "Wealthy consumption patterns are putting the poorest, most vulnerable people in harm's way."